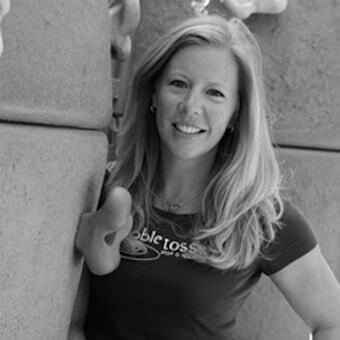 Jen Guynn is the Co-Founder and Executive Director of Pebble Tossers, a youth development nonprofit headquartered at Roam. To learn more, visit her website. Or connect with Jen on Twitter, Facebook, and LinkedIn. Somewhere in the North Atlanta suburbs today, a third-grader is turning nine. A month from now, the dozen or so presents that he so enthusiastically unwrapped at his birthday party will lie unused around the house, relegated to basement corners or bedroom crates, their novelty worn off. What if the money used to purchase these toys ($100? $200?) went instead toward putting a roof on an animal shelter, or supporting a family in crisis, or some other investment of lasting significance? This question was the initial inspiration behind the non-profit Pebble Tossers, Inc., a youth and family volunteering organization co-founded by Atlanta moms Jen Guynn and Jeni Stephens. When Jeni made her vague but sincere declaration in 2008, “Let’s start a nonprofit!” the Guynn family had already adopted this charity concept for their own birthday parties, but they hadn’t institutionalized it. The enthusiastic pair set out to do just that, although the project quickly morphed into something a little different, taking on a life of its own. Georgia Homeless Pets, VITAS Innovative Hospice Care, Interfaith Outreach Home, Trees Atlanta, Boys and Girls Clubs of Metro Atlanta. This is a just a sample of the one hundred and twenty two organizations throughout Metro Atlanta with which Pebble Tossers partners, representing twelve cause areas ranging from animal care to homeless relief, from veterans to the environment. On the flip side of the equation are Pebble Tossers’ members, a veritable army of 9000 students, teachers, parents, pastors and others who volunteer their time in support of worthy causes. These volunteers are “ready, willing, and able,” as Jen describes them, and pebbletossers.com provides the infrastructure to channel their altruistic energy by matching them with appropriate projects. Pebble Tossers members have earned a reputation among Atlanta non-profits as diligent workers. Jen recalls a particular project where one of the volunteer groups left early, whereas her Pebble Tossers crew stayed into the evening. “I guess the other group looked at their watches and thought, ‘Oh, it’s time to go. See ya!’” The project manager was pleasantly surprised by the Pebble Tossers’ work ethic, but Jen says, “Of course we stayed. Why would we leave before the job is finished?” This statement reflects an important aspect of the Pebble Tossers mentality. The members aren’t necessarily counting service hours, but are instead measuring real impact. That’s why they finish what they start, rather than stopping at an arbitrary pre-determined time. Unfortunately, the way that charity is often conducted through schools doesn’t lend itself well to this approach. When children bring in cans of soup and spend half a day stacking them, their actions are divorced from their ultimate effect of alleviating suffering. If kids can’t see the real impact of each dollar or can of soup or minute of time that they give, their service will begin to feel arbitrary and meaningless. One of Jen’s goals through Pebble Tossers is to show students the positive influence their actions can make, and impress upon them the power and significance of service. Jen has successfully instilled this mentality in her kids. Four years ago one of Jen’s daughters, twelve years old at the time, was asked by an adult if she and her family were involved in much community service. She at first answered no, which took her mother by surprise. “I nudged her and said, ‘Honey, remember when we did this project, or when we helped out that organization, or went on that trip’ and so on.” Jen’s daughter responded, “I don’t think of that as ‘community service.’ That’s just what we do.” Understandably, Jen is proud of her daughter’s outlook. “She really gets it. I didn’t even have to explain it to her.” For the Guynn girls, service is not merely an extracurricular activity like the volleyball they play after school. For them, improving the lives of those in need is a natural reflex, on a par with breathing and sleeping in its necessity. Jen’s pet cause is, unsurprisingly, the very mission of Pebble Tossers itself. It is a sort of meta-cause, the empowerment of a young generation to make changes in whichever areas match their passions. “It brings tears to my eyes when I think about what a single child volunteering today could accomplish if he continues to serve throughout his life.” Jen wants to help the youth of Atlanta toss their first few pebbles. Hopefully they will be drawn in by the rippling motion, enchanted by the ever expanding effects of their own initiative so that they can’t help but return again and again to the water’s edge. Perhaps they will learn to skip stones, making waves at three or four points with a single throw. Perhaps they will heave huge boulders into the pond. It’s hard to say exactly what it will look like if the youth of today develop life-long habits of service, but it’s bound to be good. Jen is setting up this future. Jen loves the Roam environment. Several years ago she was working exclusively from home, but in order to be more productive, she needed to be able to “go to the office.” Roam was the solution: a professional workspace away from home, but homey nonetheless. Jen remembers bringing her kids to visit. “They saw why I like it right away. My son called it the Anthropologie of workplaces.” She adds that this is a bit of a strange observation for a middle school boy to make, but she feels it’s an accurate one. When Jen first became a member, she would check her mailbox every time she arrived, only to be disappointed by its cold emptiness. “Nathan Mozingo noticed me checking my box and I think he felt sorry for me. Then one day there was a treat there for me.” The Roam team takes note when members are faced with a yawning void in their lives. They fill it with chocolate bars and good customer service. Just as Pebble Tossers represents the meta-cause that umbrellas other specific cause areas, Roam also pursues a meta-cause. The Roam team is dedicated to providing the space and services that allow small businesses and entrepreneurs to thrive. It is their passion to facilitate their members’ passions, and so they have made it their business to support their businesses. Pebble Tossers is one such business, and Roam shares with Jen’s company an emphasis on service. Roam strives to serve the Atlanta economy and community as a whole through its support of local companies. Metro Atlanta is a very large pond, but Jen’s ultimate vision for her company is far larger. She’d eventually like to set up Pebble Tossers in every major city. “No one is doing exactly what we’re doing. There are some other websites matching volunteers to causes, but they primarily cater to the corporate world. There’s no one else using the internet to offer an easy way for kids and families to find causes and do some good near home.” This is a service that has value everywhere in the country. Right now Jen is in the process of restructuring the Pebble Tossers website and business model. There will be a nominal annual membership fee for each family, which will give Pebble Tossers some operational money and help facilitate growth. Starting from its city of origin, Pebble Tossers will spread good will outward from its center, like ripples in a pond.